WordPress gives you the facility to check which search engine terms lead people to read my posts and one of the most popular searches is seafood chowder. This interest could be because this was mentioned in Fifty Shades of Grey. But what is chowder? 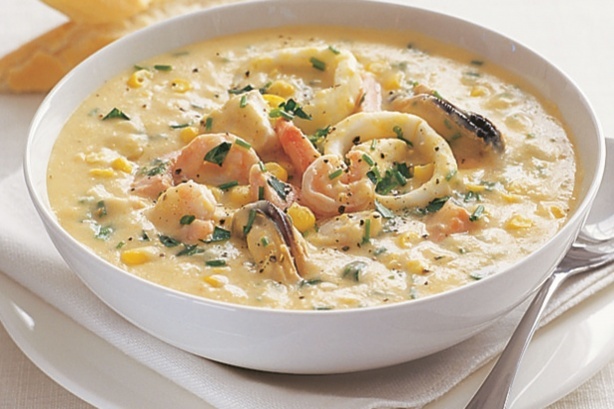 Chowder is a kind of stew ( vegetable or seafood) that is mostly served with milk or cream and crackers. The origin of the term chowder is uncertain. The word could have originated from the French term chaudière, which is a type of cooking/heating stove on which the probably these stews were cooked. Another possible (and maybe more probable) source could be the French dish called chaudrée which is a sort of thick fish soup from the coastal regions of Charente-Maritime and Vendée. Place carrot, celery, potatoes and stock in a large pan. Cover and bring to the boil. Reduce heat and simmer for about 10 minutes, or until vegetables are tender. Process mixture until smooth. Return to pan. Cut kernels from corn cobs and add to soup. Simmer for 10 minutes, or until corn is tender. Reduce heat and add marinara mix and cream. Stir, without boiling for about 3 minutes or until seafood is cooked and chowder is hot. Season to taste. Stir through chives and parsley. Serve immediately with bread.